"In Cornhill, Boston, [in the 1830s], there was a shop for the manufacture and repair of nautical instruments and philosophical apparatus, kept by Ari Davis. Mr. Davis was a very ingenious mechanic, who had invented a successful dovetailing machine, much spoken of at the time, when inventions were not as numerous as they are now. Being thus a noted man in his calling, he gave way to the foible of affecting an oddity of dress and deportment. It pleased him to say extravagant and nonsensical things, and to go about singing, and to attract attention by unusual garments. Nevertheless, being a really skilful mechanic, he was frequently consulted by the inventors and improvers of machinery, to whom he sometimes gave a valuable suggestion. In the year 1839, two men in Boston—one a mechanic, and the other a capitalist—were striving to produce a knitting-machine, which proved to be a task beyond their strength. When the inventor was at his wit's end, his capitalist brought the machine to the shop of Ari Davis, to see if that eccentric genius could suggest the solution of the difficulty, and make the machine work. The shop, resolving itself into a committee of the whole, gathered about the knitting-machine and its proprietor, and were listening to an explanation of its principle, when Davis, in his wild, extravagant way, broke in with these words: "What are you bothering yourselves with a knitting-machine for? Why don't you make a sewing-machine?" "I wish I could," said the capitalist; "but it can't be done." "Oh, yea it can," said Davis; "I can make a sewing-machine myself." "Well," said the other, "you do it, Davis, and I'll insure you an independent fortune." There, the conversation dropped, and it was never resumed. The boastful remark of the master of the shop was considered merely one of his sallies of affected extravagance, as it really was; and the response of the capitalist to it was uttered without a thought of producing an effect. Nor did it produce any effect upon the person to whom it was addressed. Davis never attempted to construct a sewing-machine. Among the workmen who stood by and listened to this conversation was a young man from the country, a new hand, named Elias Howe, then twenty years old. The person whom we have named the capitalist, a well-dressed and fine-looking man, somewhat consequential in his manners, was an imposing figure in the eyes of this youth, new to city ways; and he was much impressed with the emphatic assurance that a fortune was in store for the man who should invent a sewing-machine. He was the more struck with it, because he had already amused himself with inventing some slight improvements, and recently he had caught from Davis the habit of meditating new devices. The spirit of invention, as all mechanics know, is exceedingly contagious. One man in a shop who invents something that proves successful, will give the mania to half his companions, and the very apprentices will be tinkering over a device after their day's work is done. There were other reasons, also, why a conversation so trifling and accidental should have strongly impressed itself upon the mind of this particular youth. Before that day, the idea of sewing by the aid of a machine had never occurred to him. Elias Howe, the inventor of the sewing-machine, was born in 1819, at Spencer, in Massachusetts, where his father was a farmer and miller. There was a grist-mill, a saw-mill, and a shingle-machine on the place; but nil of them together, with the aid of a farm, yielded but a slender revenue for a man blessed with eight children. It was a custom in that neighborhood, as in New England generally, [in the 1840s], for families to carry on some kind of manufacture at which children could assist. At six years of age, Elias Howe worked with his brothers and sisters at sticking the wire teeth into strips of leather for "cards," used in the manufacture of cotton. As soon as he was old enough, he assisted upon the farm and in the mills, attending the district school in the winter months. He is now of opinion, that it was the rude and simple mills belonging to his father, which gave his mind its bent toward machinery; but he cannot remember that this bent was very decided, nor that he watched the operation of the mills with much attention to the mechanical principles involved. He was a careless, play-loving boy, and the first eleven years of his life passed without an event worth recording. At eleven, he went to "live out" with a farmer of the neighborhood, intending to remain until he was twenty-one. A kind of inherited lameness rendered the hard work of a farmer's boy distressing to him, and after trying it for a year, he returned to his father's house, and resumed his place in the mills, where he continued until he was sixteen. One of his young friends, returning from Lowell about this time, gave him such a pleasing description of that famous town, that he was on fire to go [there]. In 1835, with his parents' reluctant consent, he went to Lowell, and obtained a learner's place in a large manufactory of cotton machinery, where he remained until the crash of 1837 closed the mills of Lowell, and sent him adrift, a seeker after work. He went to Cambridge, under the shadow of venerable Harvard. He found employment there in a large machine shop, and was set at work upon the new hemp-carding machinery invented by Professor Treadwell. His cousin, Nathaniel P. Banks, since Speaker of the House of Representatives and Major-General, worked in the same shop and boarded in the same house with him. After working a few months at Cambridge, Elias Howe found employment more congenial in Boston, at the shop of Ari Davis, where the conversation occurred which we have just related. Judging merely by appearances, no one would have pitched upon him as the person likely to make one of the revolutionizing inventions of the age. Undersized, curly-headed, and exceedingly fond of his joke, he was at twenty more a boy than a man. Nor was he very proficient in his trade, nor inclined to put forth extra exertion. Steady labor was always irksome to him; and frequently, owing to the constitutional weakness to which we have alluded, it was painful. He was not the person to seize an idea with avidity, and work it out with the passionate devotion of a Watt or a Goodyear. The only immediate effect upon him of the conversation in the shop of Mr. Davis was to induce a habit of reflecting upon the art of sewing, watching the process as performed by hand, and wondering whether it was within the compass of the mechanic arts to do it by machinery. His uppermost thought, in those years, was, “What a waste of power to employ the ponderous human arm, and all the intricate machinery of the fingers, in performing an operation so simple, and for which a robin's strength would suffice!” Why not draw twelve threads through at once, or fifty? And sometimes, while visiting a shop where army and navy clothing was made, he would look at the heaps of un-sewed garments, all cut alike, all requiring the same stitch, the same number of stitches, and the same kind of seam, and say to himself, "What a pity this cannot be done by machinery! It is the very work for a machine to do." Such thoughts, however, only flitted through his mind now and then; he was still far from any serious attempt to construct a machine for sewing up the blue trousers. At twenty-one, being still a journeyman machinist, earning nine dollars a week, he married; and, in time, children came with inconvenient frequency. Nine dollars is a fixed quantity, or, rather, it was then; and the addition of three little mouths to be fed from it, and three little backs to be clothed by it, converted the vivacious father into a thoughtful and plodding citizen. His day's labor at this time, when he was upon heavy work, was so fatiguing to him, that, on reaching his home, he would sometimes be too exhausted to eat, and he would go to bed, longing, as we have heard him say, "to lie in bed for ever and ever." It was the pressure of poverty and this extreme fatigue, that caused him, about the year 1843, to set about the work of inventing the machine which, he had heard four years before, would be "an independent fortune" to the inventor. Then it was that he caught the inventor's mania, which gives its victims no rest and no peace till they have accomplished the work to which they have abandoned themselves. He wasted many months on a false scent. When he began to experiment, his only thought was to invent a machine which should do what he saw his wife doing when she sewed. He took it for granted that sewing must be that, and his first device was a needle pointed at both ends, with the eye in the middle, that should work up and down through the cloth, and carry the thread through it at each thrust. Hundreds of hours, by night and day, he brooded over this conception, and cut many a basket of chips in the endeavor to make something that would work such a needle so as to form the common stitch. He could not do it. One day, in 1844, the thought flashed upon him, “Is it necessary that a machine should imitate the performance of the hand? May there not be another stitch?” This was the crisis of the invention. The idea of using two threads, and forming a stitch by the aid of a shuttle and a curved needle, with the eye near the point, soon occurred to him, and he felt that he had invented a sewing-machine. It was in the month of October, 1844, that he was able to convince himself, by a rough model of wood and wire, that such a machine as he had projected would sew. At this time he had ceased to be a journeyman mechanic. His father had removed to Cambridge to establish a machine for cutting palm-leaf into strips for hats, —a machine invented by a brother of the elder Howe. Father and son were living in the same house, into the garret of which the son had put a lathe and a few machinists' tools, and was doing a little work on his own account. His ardor in the work of invention robbed him, however, of many hours that might have been employed, his friends thought, to better advantage by the father of a family. He was extremely poor, and his father had lost his palm-leaf machine by a fire. With an invention in his head that has since given him more than two hundred thousand dollars in a single year, and which is now yielding a profit to more than one firm of a thousand dollars a day, he could scarcely provide for his little family the necessaries of life. Nor could his invention be tested, except by making a machine of steel and iron, with the exactness and finish of a clock. At the present time, with a machine before him for a model, a good mechanic could not, with his ordinary tools, construct a sewing-machine in less than two months, nor at a less expense than three hundred dollars. Elias Howe had only his model in his head, and he had not money enough to pay for the raw material requisite for one machine. There was living then at Cambridge a young friend and schoolmate of the inventor, named George Fisher, a coal and wood merchant, who had recently inherited some property, and was not disinclined to speculate with some of it. The two friends had been in the habit of conversing together upon the project of the sewing-machine. When the inventor had reached his final conception, in the fall of 1844, he succeeded in convincing George Fisher of its feasibility, which led to a partnership between them for bringing the invention into use. The terms of this partnership were these: George Fisher was to receive into his house Elias Howe and his family, board them while Elias was making the machine, give up his garret for a workshop, and provide money for material and tools to the extent of five hundred dollars; in return for which, he was to become the proprietor of one half the patent, if the machine proved to be worth patenting. Early in December, 1844, Elias Howe moved into the house of George Fisher, set up his shop in the garret, gathered materials about him, and went to work. It was a very small, low garret, but it sufficed for one zealous, brooding workman, who did not wish for gossiping visitors. It is strange how the great things come about in this world. This George Fisher, by whose timely aid such an inestimable boon was conferred upon womankind, was led into the enterprise as much by good nature as by expectation of profit, and it was his easy acquisition of his money that made it easy for him to risk it. So far as we know, neither of the partners indulged in any dream of benevolence. Howe wanted to invent a sewing-machine to deliver himself from that painful daily toil, and Fisher was inclined to aid an old friend, and not disinclined to own a share in a valuable patent. The greatest doers of good have usually proceeded in the same homely spirit. Thus Shakespeare wrote, thus Columbus sailed, thus Watt invented, thus Newton discovered. It seems, too, that George Fisher was Elias Howe's only convert. "I believe," testified Fisher, in one of the great sewing-machine suits, "I was the only one of his neighbors and friends in Cambridge that had any confidence in the success of the invention. He was generally looked upon as very visionary in undertaking anything of the kind, and I was thought very foolish in assisting him." It is the old story. All the winter of 1844-45 Mr. Howe worked at his machine. His conception of what he intended to produce was so clear and complete, that he was little delayed by failures, but worked on with almost as much certainty and steadiness as though he had a model before him. In April, he sewed a seam by his machine. By the middle of May, 1845, he had completed his work. In July, he sewed by his machine all the seams of two suits of woolen clothes, — one suit for Mr. Fisher and the other for himself, the sewing of both of which outlasted the cloth. This first of all sewing-machines, after crossing the ocean many times, and figuring as a dumb but irrefutable witness in many a court, may still be seen [in 1881] at Mr. Howe's office in Broadway, where, within these few weeks, it has sewed seams in cloth at the rate of three hundred stitches a minute. It is agreed by all disinterested persons (Professor Eenwick among others) who have examined this machine, that Elias Howe, in making it, carried the invention of the sewing-machine farther on towards its complete and final utility, than any other inventor has ever brought a first-rate invention at the first trial. It is a little thing, that first machine, which goes into a box of the capacity of about a cubic foot and a half. Every contrivance in it has been since improved, and new devices have been added; but no successful sewing- machine has ever been made, of all the seven hundred thousand now [in 1881] in existence, which does not contain some of the essential devices of this first attempt. We make this assertion without hesitation or reserve, because it is, we believe, the one point upon which all the great makers are agreed. Judicial decisions have repeatedly affirmed it. Like all the other great inventors, Mr. Howe found that, when he had completed his machine, his difficulties had but begun. After he had brought the machine to the point of making a few stitches, he went to Boston one day to get a tailor to come to Cambridge and arrange some cloth for sewing, and give his opinion as to the quality of the work done by the machine. The comrades of the man to whom he first applied, dissuaded him from going, alleging that a sewing-machine, if it worked well, must necessarily reduce the whole fraternity of tailors to beggary; and this proved to be the unchangeable conviction of the tailors for the next ten years. It is probable that the machines first made would have been destroyed by violence, but for another fixed opinion of the tailors, which was, that no machine could be made that would really answer the purpose. It seems strange now, that the tailors of Boston could have persisted so long in such an opinion; for Mr. Howe, a few weeks after he had finished his first model, gave them an opportunity to see what it could do. He placed his little engine in one of the rooms of the Quincy Hall Clothing Manufactory, and, seating himself before it, offered to sew up any that might be brought to him. One unbelieving tailor after another, brought a garment, and saw its long seams sewed perfectly, at the rate of two hundred and fifty stitches a minute; which was about seven times as fast as the work could be done by hand. For two weeks he sat there daily, and sewed up seams for all who chose to bring them to him. He amused himself, at intervals, in executing rows of ornamental stitching, and he showed the strength of the machine by sewing the thick, plaited skirts of frock-coats to the bodies. At last, he challenged five of the swiftest seamstresses in the establishment to sew a race with the machine. Ten seams of equal length were prepared for sewing, five of which were laid by the machine, and the other five given to the girls. The gentleman who held the watch, and who was to decide the wager, testified, upon oath, that the five girls were the fastest sewers that could be found, and that they sewed "as fast as they could,—much faster than they were in the habit of sewing," —faster than they could have kept on for one hour. Nevertheless, Mr. Howe finished his five seams a little sooner than the girls finished their five; and the umpire, who was himself a tailor, has sworn, that "the work done on the machine was the neatest and strongest." Upon reading testimony like this, we wonder that manufacturers did not instantly set Mr. Howe at work making sewing-machines. Not one was ordered. Not a tailor encouraged him by word or deed. Some objected that the machine did not make the whole garment. Others dreaded to encounter the fierce opposition of the journeymen. Others really thought it would beggar all hand-sewers, and refrained from using it on principle. Others admitted the utility of the machine and the excellence of the work done by it; but, said they, "We are doing well as we are, and fear to make such a change." The great cost of the machine was a most serious obstacle to its introduction. A year or two since, Mr. Howe caused a copy of his first machine to be made for exhibition in his window, and it cost him two hundred and fifty dollars. In 1845, he could not have furnished his machine for less than five hundred dollars, and a large clothier or shirt-maker would have required thirty or forty of them. The inventor was not disheartened by the result of the introduction of the machine. The next thing was to get the invention patented, and Mr. Howe again shut himself up in George Fisher's garret for three or four months, and made another machine for deposit in the Patent Office. In the spring of 1846, there being no prospect of revenue from the invention, he engaged as "engineer" upon one of the railroads terminating at Boston, and "drove" a locomotive daily for some weeks; but the labor proved too much for his strength, and he was compelled to give it up. Late in the summer, the model and the documents being ready for the Patent Office, the two associates treated themselves to a journey to Washington, where the wonderful machine was exhibited at a fair, with no results except to amuse the crowd. [On] September 10, 1846, the patent was issued, and soon after the young men returned to Cambridge. George Fisher was now totally discouraged. He had maintained the inventor and his family for many months; he had provided the money for the tools and material for two machines; he had paid the expense of getting the patent, and of the journey to Washington; he had advanced in all about two thousand dollars; and he saw not the remotest probability of the invention becoming profitable. Elias Howe moved back to his father's house, and George Fisher considered his advances in the light of a dead loss. "I had lost confidence," he has since testified, "in the machine's ever paying anything." But mothers and inventors do not give up their offspring so. America having rejected the invention, Mr. Howe resolved to offer it to England. In October, 1846, his brother, Amasa B. Howe, with the assistance of their father, took passage in the steerage of a sailing packet, and conveyed one of the machines to London. An Englishman was the first manufacturer who had faith enough in the American sewing-machine to invest money in it. In Cheapside, Amasa Howe came upon the shop of William Thomas, who employed, according to his own account, five thousand persons in the manufacture of corsets, umbrellas, valises, carpet bags, and shoes. William Thomas examined and approved the machine. Necessity, as poor Richard remarks, cannot make a good bargain; but the bargain which it made on this occasion, through the agency of Amasa B. Howe, was signally bad. He sold to Mr. Thomas, for two hundred and fifty pounds sterling, the machine he had brought with him, and the right to use as many others in his own business as he desired. There was also a verbal understanding that Mr. Thomas was to patent the invention in England, and, if the machine came into use there, he was to pay the inventor three pounds on every machine sold. That was an excellent day's work for William Thomas of Cheapside. The verbal part of the bargain has never been carried out. He patented the invention; and ever since the machines began to be used, all sewing-machines made in England, or imported into England, have paid tribute to him at the rate of ten pounds or less for each machine. Elias Howe is of opinion that the investment of that two hundred and fifty pounds has yielded a profit of one million dollars. Mr. Thomas further proposed to engage the inventor to adapt the machine to the work upon corsets, offering him the munificent stipend of three pounds a week, and to defray the expense of workshop, tools, and material. Amasa B. Howe returned to Cambridge with this offer. America being still insensible to the charms of the new invention, and the two hundred and fifty pounds having been immediately absorbed by the long-accumulating necessities of the family, and there being no prospect of advantageous employment at home, Elias Howe accepted the offer, and both brothers set sail for London, February 5, 1847. They went in the steerage, and cooked their own provisions. William Thomas provided a shop and its requisites, and even advanced money for the passage to England of the inventor's family, who joined him soon, — wife and three children. After eight mouths of labor, the inventor succeeded in adopting his machine to the purposes of the stay-maker; and when this was done, the stay-maker apparently desired to get rid of the inventor. He required him to do the miscellaneous repairs, and took the tone with him which the ignorant purse-holder, in all lauds, is accustomed to hold in his dealings with those to whom he pays wages. The Yankee, of course, resented this behavior, and William Thomas discharged Elias Howe from his employment. To be a poor stranger, with a sick wife and three children in America, is to be in a purgatory that is provided with a practicable door into paradise. To be such it person in London, is to be in a hell without visible outlet. Since undertaking to write this little history of the sewing-machine, we have gone over about thirty thousand pages of printed testimony, taken in the numerous suits to which sewing-machine patents have given rise. Of all these pages, the most interesting are those from which we can gather the history of Elias Howe during the next few months. From a chance acquaintance, named Charles Inglis, a coach-maker, who proved to be a true friend, he hired a small room for a work-shop, in which, after borrowing a few tools, he began to construct his fourth sewing-machine. Long before it was finished, he saw that he must reduce his expenses or leave his machine unfinished. From three rooms, he removed his family to one, and that a small one in the cheapest quarter of Surrey. Nor did that economy suffice; and he resolved to send his family home while he could, and trust to the machine in hand for the means to follow them. "Before his wife left London," testifies Mr. Inglis, "he had frequently borrowed money from me in sums of five pounds, and requested me to get him credit for provisions. On the evening of Mrs. Howe's departure, the night was very wet and stormy, and, her health being delicate, she was unable to walk to the ship. He had no money to pay the cab-hire, and he borrowed a few shillings from me to pay it, which he repaid by pledging some of his clothing. Some linen came home from his washerwoman for his wife and children on the day of her departure. She could not take it with her on account of not having money to pay the woman." After the departure of his family, the solitary inventor was still more severely pinched. "He has borrowed a shilling from me," says Mr. Inglis, "for the purpose of buying beans, which I saw him cook and eat in his own room." After three or four months of labor, the machine was finished. It was worth fifty pounds. The only customer he could find for it was a working man of his acquaintance, who offered five pounds for it, if he could have time to pay it in. The inventor was obliged to accept this offer. The purchaser gave his note for the five pounds, which Charles Inglis succeeded in selling to another mechanic for four pounds. To pay his debts and his expenses home, Mr. Howe pawned his precious first machine and his letters-patent. "He drew a hand-cart, with his baggage on it, to the ship, to save the expense of cartage;" and again he took passage in the steerage, along with his English friend, Charles Inglis. His brother Amasa had long before returned to America. In April, 1849, Elias Howe landed in New York, after an absence of two years from the country, with half a crown in his pocket. Four years had nearly elapsed since the completion of his first machine, and this small piece of silver was the net result of his labors upon that invention. He and his friend went to one of the cheapest emigrant boarding houses, and Elias Howe sought employment in the machine shops, which luckily he found without delay. The news reached him soon that his wife was dying of consumption, but he had not the money for a journey to Cambridge. In a few days, however, he received ten dollars from his father, and he was thus enabled to reach his wife's bedside, and receive her last breath. He had no clothes except those he daily wore, and he was obliged to borrow a suit from his brother-in-law in which to appear at the funeral. It was remarked by his old friends, that his natural gaiety of disposition was quite quenched by the severity of his recent trials. He was extremely downcast and worn. He looked like a man just out after a long and agonizing sickness. Soon came the intelligence that the ship, in which he had embarked all his household goods, had been wrecked off Cape Cod, and was a total loss. But now he was among friends, who hastened to relieve his immediate necessities, and who took care of his children. He was soon at work; not, indeed, at his beloved machine, but at work which his friends considered much more rational. He was again a journeyman machinist at weekly wages. As nature never bestows two eminent gifts upon the same individual, the man who makes a great invention is seldom the man who prevails upon the public to use it. Every Watt needs his Boulton. Neither George Fisher nor Elias Howe possessed the executive force requisite for so difficult a piece of work as the introduction of a machine which then cost two or three hundred dollars to make, and upon which a purchaser had to take lessons as upon the piano, and which the whole body of tailors regarded with dread, aversion, or contempt. It was reserved, therefore, for other men to educate the people into availing themselves of this exquisite labor-saving apparatus. 8 A. M. to 5 P. M.
The public was informed by other bills, that this wonderful machine could make a pair of pantaloons in forty minutes, and do the work of six hands. The people of Ithaca, it appears, attended the exhibition in great numbers, and many ladies carried home specimens of the sewing, which they preserved as curiosities. But this was not all. Some machinists and others in Boston, and elsewhere, were making sewing-machines in a rude, imperfect manner, several of which had been sold to manufacturers, and were in daily operation. The inventor, upon inspecting these crude products, saw that they all contained the devices which he had first combined and patented. Poor as he was, he was not disposed to submit to this infringement, and he began forthwith to prepare for war against the infringers. When he entered upon this litigation, he was a journeyman machinist; his machine and his letters-patent were in pawn, three thousand miles away, and the patience, if not the purses, of his friends was exhausted. When the contest ended, a leading branch of the national industry was tributary to him. The first step was to get back from England that first machine, and the document issued from the Patent Office. In the course of the summer of 1849, he contrived to raise the hundred dollars requisite for their deliverance; and the Hon. Anson Burlingame, who was going to London, kindly undertook to hunt them up in the wilderness of Surrey. He found them, and sent them home in the autumn of the same year. The inventor wrote polite letters to the infringers, warning them to desist, and offering to sell them licenses to continue. All but one of them, it appears, were disposed to acknowledge his rights, and to accept his proposal. That one induced the others to resist, and nothing remained but a resort to the courts. Assisted by his father, the inventor began a suit; but he was soon made aware that justice is a commodity much beyond the means of a journeyman mechanic. He tried to reawaken the faith of George Fisher, and induce him to furnish the sinews of war; but George Fisher had had enough of the sewing-machine; he would sell his half of the patent for what it had cost him; hut he would advance no more money. Mr. Howe then looked about for some one who would buy George Fisher's share. He found three men who agreed to do this, — and tried to do it, but could not raise the money. The person to whom he was finally indebted for the means of securing his rights, was George W. Bliss, of Massachusetts, who was prevailed upon to buy Mr. Fisher's share of the patent, and to advance the money needful for carrying on the suits. He did this only as a speculation. He thought there might be something in this new notion of sewing by machinery, and, if there was, the machine must become universal, and yield large revenues. This might be; he even thought it probable; still, so weak was his faith, that ho consented to embark in the enterprise only on condition of his being secured against loss by a mortgage on the farm of the inventor's father. This generous parent—who [in 1881 was] still living in Cambridge—came once more to the rescue, and thus secured his son's fortune. The suits went on; but, as they went on at the usual pace of patent cases, the inventor had abundant leisure to push his invention out of doors. Towards the close of 1850, we find him in New York, superintending the construction of fourteen sewing-machines at a shop in Gold Street, adjoining which he had a small office, furnished with a five-dollar desk and two fifty-cent chairs. One of those machines was exhibited at the fair in Castle Garden in October, 1851, where, for the space of two weeks, it sewed gaiters, pantaloons, and other work. Several of them were sold to a boot-maker in Worcester, who used them for sewing boot-legs, with perfect success. Two or three others were daily operated in Broadway, to the satisfaction of the purchasers. We can say, therefore, of Elias Howe, that besides inventing the sewing-machine, and besides making the first machine with his own hands, he brought his invention to the point of its successful employment in manufacture. While he was thus engaged, events occurred which seriously threatened to rob him of all the benefit of his invention. The infringers of his patent were not men of large means nor of extraordinary energy, and they had no "case" whatever. There was the machine which Elias Howe had made in 1845, there were his letters-patent, and all the sewing-machines then known to be in existence were essentially the same as his. But in August, 1850, a man became involved with the infringers who was of very different mettle from those steady-going Yankees, and capable of carrying on a much more vigorous warfare than they. This was that Isaac Merritt Singer, who [later] so often astonished the Fifth Avenue, and is now amusing Paris, by the oddity and splendor of his equipages. He was then a poor and baffled adventurer! He had been an actor and manager of a theatre, and had tried his hand at various enterprises, none of which had been very successful. In 1850, he invented (as he has since sworn) a carving-machine, and having obtained an order for one from Boston, he made it, and took it himself to Boston. In the shop in which he placed his carving- machine, he saw, for the first time, several sewing-machines, brought there for repairs. Orson C. Phelps, the proprietor of the shop (Mr. Singer says), showed him one of these machines, and said to him that, if it could be improved so as to render it capable of doing a greater variety of work, "it would be a good thing;" and if Singer could accomplish this, he could get more money from sewing than from carving-machines. Whereupon, Mr. Singer contemplated the apparatus, and at night meditated upon it, with so much success, that he was able in the morning to exhibit a drawing of an improved machine. This sketch (so he swears) contained three original devices, which, to this day, form part of the sewing-machine made by the Singer Company. The sketch being approved, the next thing was to construct a model. Mr. Singer having no money, the purchaser of his carving-machine agreed to advance fifty dollars for the purpose; upon which Mr. Singer flew at the work like a tiger. "I worked," he says, "day and night, sleeping but three or four hours out of the twenty-four, and eating generally but once a day, as I knew I must get a machine made for forty dollars, or not get it at all. The machine was completed the night of the eleventh day from the day it was commenced. About nine o'clock that evening, we got the parts of the machine together, and commenced trying it. The first attempt to sew was unsuccessful; and the workmen, who were tired out with almost unremitting work, left me, one by one, intimating that it was a failure. I continued trying the machine, with Zieber" (who furnished the forty dollars) "to hold the lamp for me, but, in the nervous condition to which I had been reduced by incessant work and anxiety, was unsuccessful in getting the machine to sew tight stitches. About midnight, I started with Zieber to the hotel where I boarded. Upon the way, we sat down on a pile of boards, and Zieber asked me if I had noticed that the loose loops of thread on the upper side of the cloth came from the needle. It then flashed upon me that I had forgotten to adjust the tension upon the needle thread. Zieber and I went back to the shop. I adjusted the tension, tried the machine, and sewed five stitches perfectly, when the thread broke. The perfection of those stitches satisfied me that the machine was a success, and I stopped work, went to the hotel, and had a sound sleep. By three o'clock the next day, I had the machine finished, and started with it to New York, where I employed Mr. Charles M. Keller to get out a patent for it." Such was the introduction to the sewing-machine of the man whose energy and audacity forced the machine upon an unbelieving public. He borrowed a little money, and forming a partnership with his Boston patron and the machinist in whose shop he had made his model, began the manufacture of the machines. Great and numerous were the difficulties which arose in his path, but, one by one, he overcame them all. He advertised, he traveled, he sent out agents, he procured the insertion of articles in the newspapers, he exhibited the machine at fairs in town and country. Several times he was upon the point of failure, but in the nick of time something always happened to save him, and year after year he advanced toward an assured success. We well remember his early efforts, when he had only the back part of a small store in Broadway, and a little shop over a railroad depot; and we remember also the general incredulity with regard to the value of the machine with which his name was identified. Even after hearing him explain it at great length, we were very far from expecting to see him, one day, riding to the Central Park in a French diligence, drawn by five horses, paid for by the sewing-machine. Still less did we anticipate that, within fourteen years, the Singer Company would be selling two thousand sewing-machines a week, at a profit of a thousand dollars a day. He was the true pioneer of the mere business of selling the machines, and made it easier for all his subsequent competitors. Mr. Singer had not been long in the business before he was reminded by Elias Howe that he was infringing his patent of 1846. The adventurer threw all his energy and his growing means into the contest against the original inventor. The great object of the infringing interest was to discover an earlier inventor than Elias Howe. For this purpose, the patents records of England, France, and the United States were most diligently searched; encyclopedias were examined; and an attempt was even made to show that the Chinese had possessed a sewing-machine for ages. Nothing, however, was discovered that would have made a plausible defense, until Mr. Singer joined the infringers. He ascertained that a New York mechanic, named Walter Hunt, who had a small machine-shop up a narrow alley in Abingdon Square, had made, or tried to make, a sewing-machine as early as 1832. Walter Hunt was found. He had attempted to invent a sewing-machine in 1832; and, what was more important, he had hit upon the shuttle as the means of forming the stitch. He said, too, that he had made a machine which did sew a little, but very imperfectly, and, after wearying himself with fruitless experiments, he had thrown aside. Parts of this machine, after a great deal of trouble, were actually found among a quantity of rubbish in the garret of a house in Gold Street. Here was a discovery! Could Mr. Hunt take these parts, all rusty and broken, into his shop, and complete the machine as originally made, so that it would sew? He thought he could. Urged on by the indefatigable Singer, supplied by him with money, and stimulated by the prospect of fortune, Walter Hunt tried hard and long to put his machine together; and when he found that he could not, he employed an ingenious inventor to aid him in the work. But their united ingenuity was unequal to the performance of an impossibility; the machine could not be got to sew a seam. The fragments found in the garret did indeed demonstrate that, in 1832, Walter Hunt had been upon the track of the invention; but they also proved that he had given up the chase in despair, long before coining up with the game. And this the courts have uniformly held. In the year 1854, after long trial, Judge Sprague, of Massachusetts, decided that "the plaintiff's patent is valid, and the defendant's machine is an infringement." The plaintiff was Elias Howe; the real infringer, I. M. Singer. Judge Sprague further observed, that "there is no evidence in this case, that leaves a shadow of doubt that, for all the benefit conferred upon the public by the introduction of a sewing-machine, the public are indebted to Mr. Howe." This decision was made when nine years had elapsed since the completion of the first machine, and when eight years of the term of the first patent had expired. The patent, however, even then, was so little productive, that the inventor, embarrassed as he was, was able, upon the death of his partner, Mr. Bliss, to buy his share of it. He thus became, for the first time, the sole proprietor of his patent; and this occurred just when it was about to yield a princely revenue. From a few hundreds a year, his income rapidly increased, until it went beyond two hundred thousand dollars. He received in all not much less than two millions. As Mr. Howe devoted twenty-seven years of his life to the invention and development of the sewing-machine, the public compensated him at the rate of seventy-five thousand dollars a year. It cost him, however, immense sums to defend his rights, and he was very far from being the richest of the sewing-machine kings. He had the inconvenient reputation of being worth four millions, which was exactly ten times the value of his estate. So much for the inventor. In speaking of the improvers of the sewing-machine, we know not how to be cautious enough; for scarcely anything can be said on that branch of the subject which some one has not an interest to deny. We, the other day, looked over the testimony taken in one of the suits which Messrs. Grover and Baker have had to sustain in defence of their well-known "stitch." The testimony in that single case fills two immense volumes, containing three thousand five hundred and seventy-five pages. At the Wheeler and Wilson establishment in Broadway [in 1881], there [was] a library of similar volumes, resembling in appearance a quantity of London and Paris Directories. The Singer Company is equally blessed with sewing-machine literature, and Mr. Howe had chests full of it. We learn from these volumes that there is no useful device connected with the apparatus, the invention of which is not claimed by more than one person. And no wonder. If today the ingenious reader could invent the slightest real improvement to the sewing-machine, so real that a machine having it would possess an obvious advantage over all machines that had it not, and he should sell the right to use that improvement at so low a rate as fifty cents for each machine, he would find himself in the enjoyment of an income of one hundred thousand dollars per annum. The consequence is, that the number of patents already issued in the United States for sewing-machines, and improvements in sewing-machines [in 1881], is about nine hundred! Perhaps thirty of these patents are valuable; but the great improvements are not more than ten in number, and most of those were made in the infancy of the machine. By general consent of the able men who are now conducting the sewing-machine business, the highest place in the list of improvers is assigned to Allen B. Wilson. This most ingenious gentleman completed a practical sewing-machine early in 1849, without ever having seen one, and without having any knowledge of the devices of Elias Howe, who was then buried alive in London. Mr. Wilson, at the time, was a very young journeyman cabinet-maker, living in Pittsfield, Massachusetts. After that desperate contest with difficulty which inventors usually experience, he procured a patent for his machine, improved it, and formed a connection with a young carriage-maker of his acquaintance, Nathaniel Wheeler, who had some capital; and thus was founded the great and famous house of Wheeler and Wilson, who [in 1881, were] making sewing-machines at the rate of about fifty-three thousand a year. These gentlemen were honest enough in opposing the claim of Elias Howe, since Mr. Wilson knew himself to be an original inventor, and he employed devices not to be found in Mr. Howe's machine. Instead of a shuttle, he used a "rotating hook," — a device as ingenious as any in mechanism. The "four-motion feed," too, was another of Mr. Wilson's masterly inventions, sufficient of itself to stamp him as an inventor of genius. Nothing, therefore, was more natural than that Messrs. Wheeler and Wilson should regard Mr. Howe's charge of infringement with astonishment and indignation, and join in the contest against him. Messrs. Grover and Baker (see image above) were early in the field. 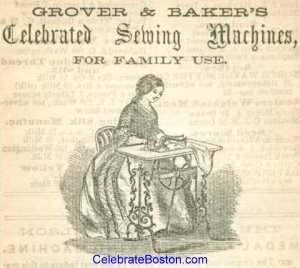 William O. Grover was a Boston tailor, whose attention was directed to the sewing-machine soon after Mr. Howe's return from Europe. It was he who, after numberless trials, invented the exquisite devices by which the famous "Grover and Baker stitch" is formed, — a stitch which, for some purposes, is of unequalled utility. When, by the decision of the courts, all the makers had become tributary to Elias Howe, paying him a certain sum for each machine made, then a most violent warfare broke out among the leading houses, — Singer and Company, Wheeler and Wilson, Grover and Baker, — each accusing the others of infringement. At Albany, in 1856, these causes were to be tried; and parties concerned saw before them a good three months' work in court. By a lucky chance, one member of this happy family had not entirely lost his temper, and was still in some degree capable of using his intellect. It occurred to this wise head, that, no matter who invented first, or who second, there were then assembled at Albany the men who, among them, held patents which controlled the whole business of making sewing-machines; and that it would be infinitely better for them to combine and control, than to contend with and devour one another. They all came into this opinion; and thus was formed the "Combination," of which such terrible things are uttered by the surreptitious makers of sewing-machines. Elias Howe, who was the best-tempered man in the world, and only too easy in matters pecuniary, had the complaisance to join this confederation, only insisting that at least twenty-four licenses should be issued by it, so as to prevent the manufacture from sinking into a monopoly. By the terms of this agreement, Mr. Howe was to receive five dollars upon every machine sold in the United States, and one dollar upon each one exported. The other parties agreed to sell licenses to use their various devices, or any of them, at the rate of fifteen dollars for each machine; but no license was to be granted without the consent of all the parties. It was further agreed that part of the license fees received should be reserved as a fund for the prosecution of infringers. This agreement remained unchanged until the renewal of Mr. Howe's patent in 1860, when his fee was reduced from five dollars to one dollar, and that of the Combination from fifteen dollars to seven. That is to say, every sewing-machine honestly made paid Elias Howe one dollar; and every sewing-machine made, which included any device or devices the patent for which is held by any other member of the Combination, paid seven dollars to the Combination. Of this seven dollars, Mr. Howe received his one, and the other six went into the fund for the defense of the patents against infringers.